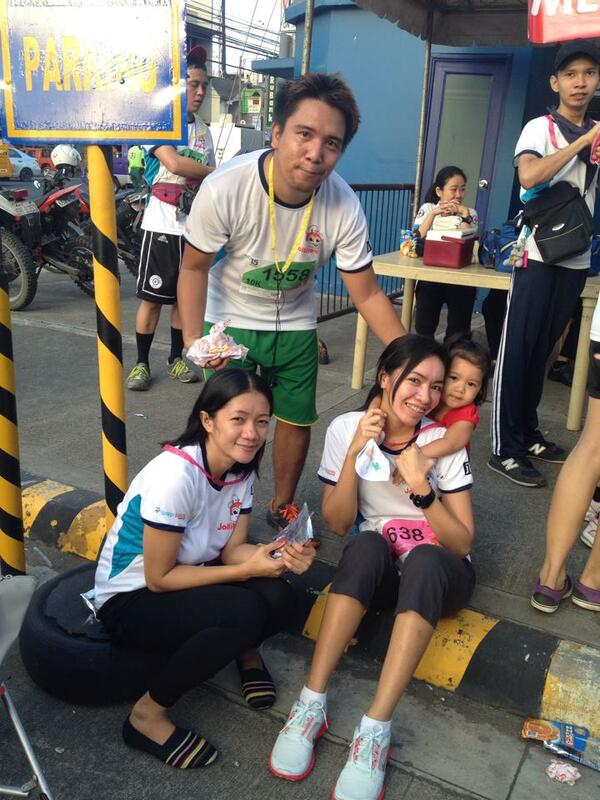 My First Fun Run | Life, Music and the Web… Revived! So we headed to NCCC mall, that’s the venue of the race and the starting line, with my wife and her friend and with our baby daughter glee who was still half asleep in the car. They we’re running too but only 3k and they brought a stroller where our daughter would just sit and my wife pushing the stroller throughout the length of their race. I went ahead and run earlier than them because i’m gunning for 10k so our gun start was an hour earlier than them. So i went to the crowd, then have my race details checked and then i heard the call for all the 10k runners. I then headed to the assembly area with the runners who are also participating. I had no running buddy with me so i just stood at the corner listening to some songs from my phone. I also whispered my prayers and asks for his guidance and protection while running. At exactly 5am, we we’re sent off by the gun signal. I ran at my comfortable pace, too comfortable as a matter of fact. I treated it just like a morning jog with no pressure at all and not minding other runners. Because of that i started really, really slow, in fact all other runners behind me passed me and it did not take long for me to realize that there are no other runners behind me and so it dawned into me that i am dead last! lol. I did not panic and try to increase my pace, I did say to my mind that maybe these guys are already veteran in running 10k and they have joined countless of fun runs and i am not gonna compare myself to them because it was my first time. With that mind set i did not feel any pressure. There were really out of shape runners ahead of me and i was thinking how can they run that fast when they look like they haven’t been exercising at all. But still i did not let myself get carried away and try to beat those out of shape runners. I just ran as relaxed and as calm as I could. I just sustained my pace. After more than 2 kilometers and there was this uphill road, that’s when i saw many runners already walking and really slowing down. One by one i was beginning to pass by the guys who i mentioned earlier that were ahead of me. Somehow i felt relieved that my decision to just ran calmly paid off because i still has lots of energy. Although there are those guys who are really fast and got more in the tank i didn’t let them affect my psyche, i conceded that i’m not in this run to be first or have a place and beat a significant time. This is more of an experience run and maybe challenge myself to see if can hang out with casual runners who could do 10k, as the race went on, my legs became sore and it did not help that i stepped on a stone on the road causing me to trip my left ankle a little bit although it’s nothing major but there was a little pain. Although all in all it did not bother of affect my performance. Then it came to the 5k turning point, i was so happy there was free bananas at that turning point as i became quite hungry as i only ate some maybe cereal and a little banana for breakfast. That proved to be a big energy boost for me. It helped also that there are a lot of water stations along the race, it really pays if you are well hydrated while running. So on the turning point i felt that i still have a lot left in the tank, i maybe upped my pace and there i passed by some of the runners ahead of me, specially those two young guys which are 50 meters ahead of me throughout. I passed them around the 7k mark. When i saw the signage of the mall and the finish line i really put on the race effort because i badly want to rest already and stand still and stop running. It’s still 2-3km to go and i felt that running faster is a must because maybe just maybe my brain will say I am already to tired and won’t be able to finish it anymore. Stride by stride i was getting nearer and nearer and before the finish line there was a traffic intersection we were asked to stop by a traffic enforcer for a while. So i ignorantly jogged in place thinking my body will cool down when i stop and my heart won’t like it and it is too dangerous which I later on learned that how idiot i am for doing it, most runners advise against jogging in place when on an intersection. Then after the cars passed by, the finish line was just 10meters ahead so i stride and their i finished and conquered the 10k fun run and it was really an enjoyable first time! I felt like it was already a really big goal and a big step up for me after my first jogs last year where i can barely run 1 kilometer without my heart racing and my lungs gasping for air. With this achievement, I admit i can not do this alone. No way. God made this possible for me. He wanted me to stop my vices, quit smoking, quit drinking, quit eating unhealthy stuffs and quit everything i am doing that is detrimental to my health. I acknowledge what God wants for me, if he permits and wants me to live as long as possible then i will gladly accept it. But no way that i will not use his gift of life for me here on earth doing nothing, In every day that God has added a morning in my life, i must use it to praise him and give him glory and tell the world about him and how we should all put our faith in him. In everything we do let us give God the glory, without him we are nothing.